GDPR: What are the implications for the insurance industry? We made a list of the top 5 articles on GDPR to help you get an idea of what the new regulation means to businesses. So – what is GDPR and what does it mean for insurance brokers and their clients? General Data Protection Regulation (GDPR) launched earlier in 2018 and fundamentally aims to regulate the processing of personal data in order to protect the privacy of individuals and businesses. In a recent survey from DAS – 4 out of 10 UK brokers were unaware of GDPR changes required in view of the new regulations. Within insurance, brokers will need to pay more attention when collecting personal data from clients that could be considered sensitive. This poses a challenge, since clients will need to give consent and the rules around data control will be stricter. 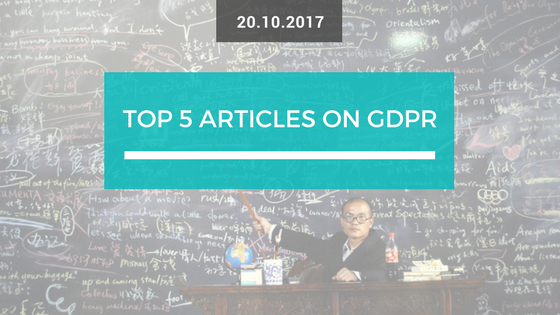 We have collected the top 5 articles about GDPR to show the most relevant information required when looking at implementing the new rules. GDPR: Is your small business ready for the ‘Right to be Forgotten’? If your company is looking into creating a GDPR policy – why not take notes from Google who have already published how they plan to follow the new guidelines plus some tips for companies who haven’t figured out what they need to do yet. It is clearly an important change in the way that businesses will work, so the insurance industry and your clients will need to be aware of what is required to avoid any unwanted fines. What impact do you think GDPR will have on the Insurance industry? Will individual brokers be affected by the implementation of GDPR? Why not share these top 5 articles with your clients and help them prepare for the changes!